The question took me by surprise. I had just finished lecturing to about 75 undergraduates at Peking University on the virtues of American-style pragmatic liberal education. My book Beyond the University: Why Liberal Education Matters had recently been translated into Chinese, and I was on a speaking tour trying to persuade students and their families that in a society changing so rapidly, it made the most sense to pursue a broad education in which you would learn how to take multiple perspectives on shifting, complex problems and opportunities—to learn how to learn. The question was whether a liberal education really made students think for themselves—as I had argued—or whether it just turned students into liberals. Encouraged by my visible interest and surprise, he asked more pointedly if liberal learning didn’t contribute to the divisiveness that was currently afflicting American society by reinforcing a sense, for some people, of superiority and, for others, that elites with fancy diplomas were looking down on them. At Wesleyan, we have in the last few years focused on ensuring that our students benefit from the intellectual diversity that is a foundational pillar of liberal education. We work hard to ensure that we have the diversity and the freedom of speech that allows for robust discussions of issues that matter—issues upon which reasonable people can have deep disagreements. The young man’s second question was equally challenging. Was a liberal education a pathway to elitism, cementing economic inequality and enabling a fortunate few to assume an attitude of haughty privilege? That is certainly possible, I admitted. One of the reasons many families want to send their children to top-ranked colleges is that they are highly selective—they reject lots of people, the thinking goes, so they must be good! More than that, the student was asking whether those who enroll in such institutions contribute, unwittingly or not, to a national climate of hostile divisiveness. Throughout American history, writers have argued that while education was essential for a healthy democracy, it could also lead to the corruption of pretentious elites condescending to their fellow citizens (if they recognized them at all). At Wesleyan, our efforts at creating equity and inclusion are meant to reject the elitism that may be a by-product of highly selective admissions. People who do well on exams don’t have all the answers, our students and faculty know. They should have good questions, but these questions are productive only if one is willing to listen to a variety of answers. After I answered my interlocutor in Beijing, a young woman sitting up front asked if I wasn’t really just echoing a campus cultural bubble when I spoke of liberal learning in such idealistic ways. Ah, so talk of the bubble has made its way to China, I thought. Sure, I admitted, it may well be that efforts to nurture free inquiry have led to somewhat protective bubbles. But the American tradition of liberal education I was talking about held that real inquiry had to be tested beyond the university, that real learning had to be relevant beyond the classroom and the borders of the campus. This American educational tradition, alive and well at Wesleyan, took a bet on what pragmatist philosopher John Dewey called “practical idealism,” a bet on the value of situating learning in relation to society and the aim of contributing to its well-being. In China, more than half a million students each year study abroad, and scores of thousands are majoring in foreign languages and culture. Notwithstanding the central government’s frightening efforts to enforce narrow forms of political and vocational training, exposure to other societies will enrich the country by disrupting increasingly bureaucratized homogeneity. And Americans will benefit from exposure to Chinese ideas and practices. That’s why we’re very excited about spreading the word about pragmatic liberal education there, and hearing responses to our ideas from smart and ambitious students and their families. We believe that higher education can be pragmatic without being conformist, and that the college years will inspire students to think for themselves in ways that will be significant to others. A pragmatic liberal education promises to engage with issues that students will surely have to deal with beyond their university years, while refusing to be just a training program that will, in the short run, slide them into the existing slots offered by the status quo. It has often fulfilled this promise in the past, and it is strong enough today to welcome and weather tough questions—from the United States or from China—about its future. 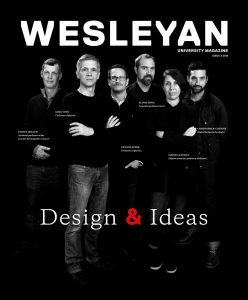 Coda: The power of a Wesleyan education is evident in the achievements of its alumni, and the person most important in sharing those achievements over many years now has been Bill Holder ’75, editor of this magazine. Bill is retiring in June, and, while there will be other occasions in which to express our appreciation, I take the opportunity to do that here, in print, in the magazine he has guided so ably for so long. Our profound thanks to you, Bill!